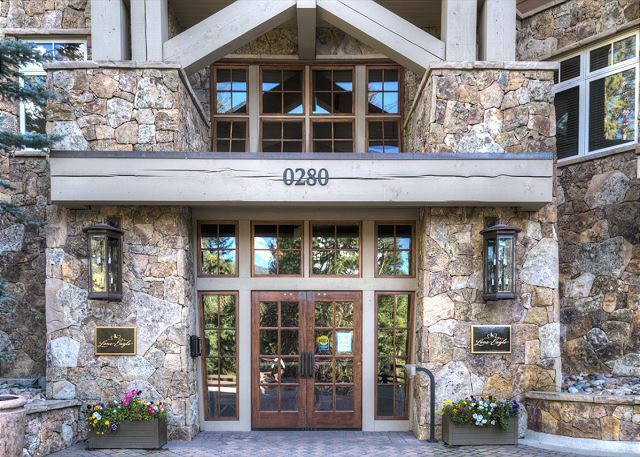 This spacious 1,315 square foot 2-bedroom, 2-bathroom condo sleeps eight and features stunning ski slope views. Watch the skiers and snowboarders as they come down the mountain. Inside you’ll find high-end finishes throughout including a gourmet kitchen, beautiful bathrooms and private laundry. 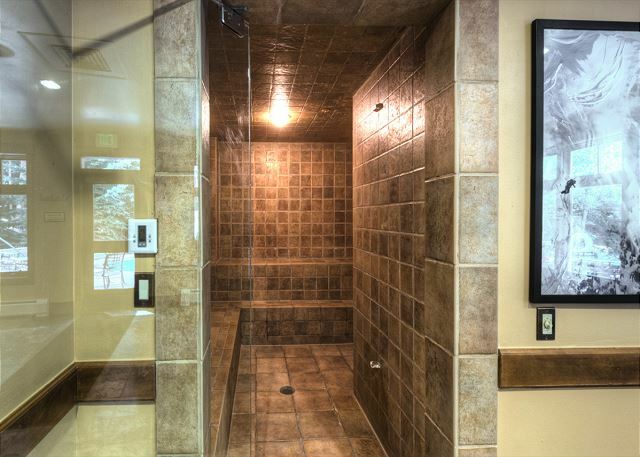 Enjoy the luxury of this ski-in/ski-out complex. The entryway has mounted hooks and a bench for your convenience while coming and going throughout the day. The living area features a flat screen TV mounted above a beautiful gas fireplace. The sofa pulls out into a queen-sized bed and extra sheets and blankets are in a closet. 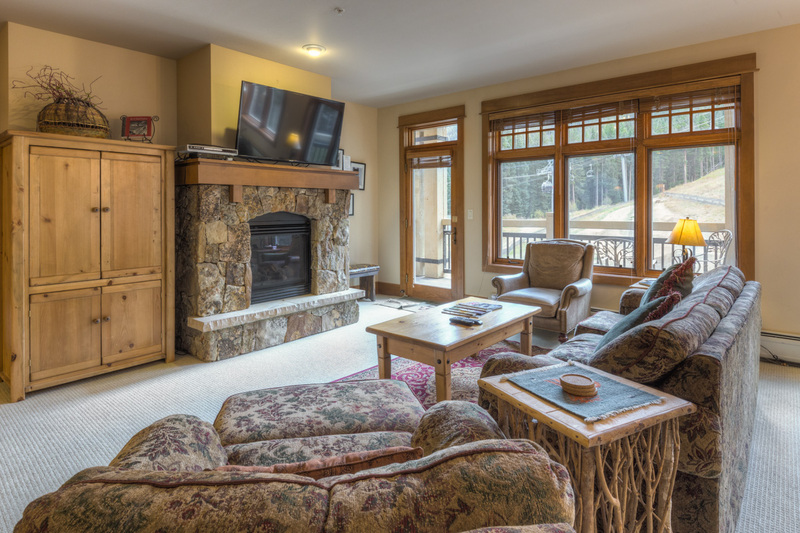 Just off of the living area is the private balcony where you can enjoy stunning, up-close, ski-slope views. 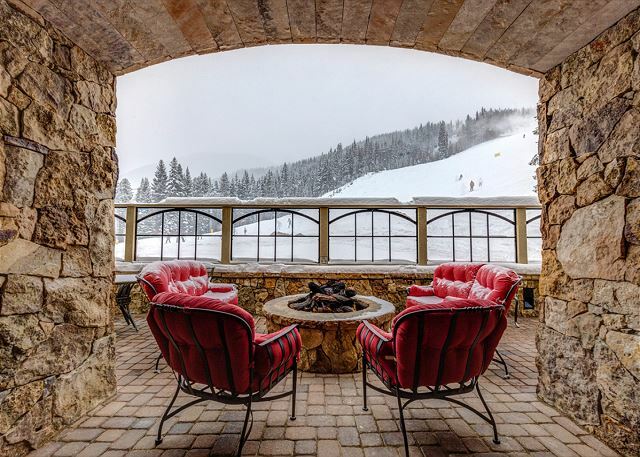 Sit back with a warm beverage while watching family and friends come down the mountain. The full-sized kitchen is stocked with all the essential cookware and tableware to make a meal away from home and features granite countertops and stainless steel appliances. The dining area comfortably seats six with three additional seats at the breakfast bar. The first of two full bathrooms is located just off of the living area and features a pedestal sink and an oversized, glass-enclosed shower with two shower heads and a bench. All bathrooms are stocked with towels and an initial supply of toiletries. There’s a private washer and dryer and detergent has been provided for your convenience. The master bedroom features a king-sized bed with a new mattress and designer bedding. It also offers beautiful slope views as well as a flat screen TV. The en suite bathroom has double sinks, a jetted tub, a separate walk-in shower with glass enclosure and a door separates the toilet area for added privacy. The guest bedroom has a flat screen TV and a twin-over-queen bunk bed with a twin trundle that pulls out from underneath. 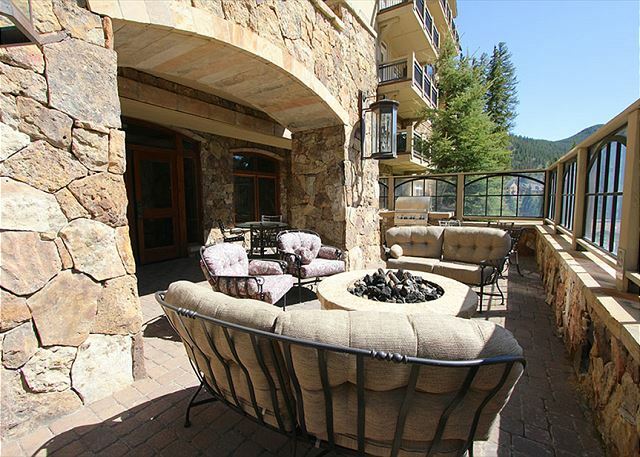 It was a lovely condo with gorgeous views of the slopes and true ski in ski out. A perfect summer vacation spot! Our family of six had such a wonderful experience at Lone Eagle in Keystone! The condo was clean and well kept. We had plenty of space for our family. The location was perfect. Just a short walk to River Run Village (shops, adventure center, restaurants, gondola, etc) without actually being in the village. 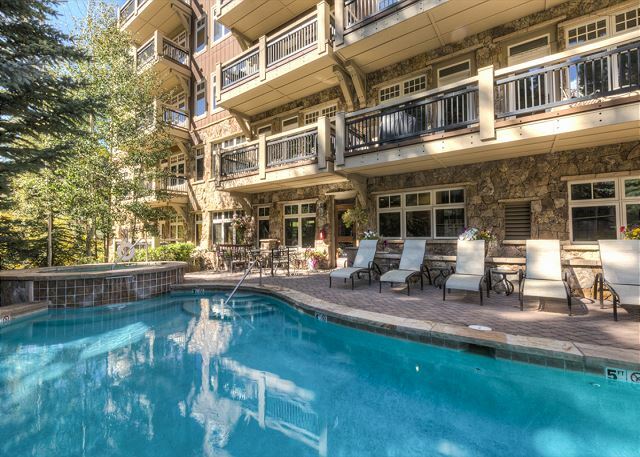 And a short drive to nearby attractions like Lakeside Village and Frisco marina. The view from our balcony was beautiful! It was such a magical week for our family. We will definitely be back! Our stay at Lone Eagle was amazing! As promised, the condo provided a true ski in/ski out location with beautiful slope side views. The unit was spacious with great bathrooms and a fully functional kitchen. The guest bedroom was a great fit for kids with a bunk bed (queen on the bottom) and the pull out sofa was a true queen. Would reserve exact same unit upon return. Only trouble was controlling heat—unit was too warm even on lowest setting. Loved this condo. It was right by the slopes and you could watch skiers right outside your window. The complex was clean at all times and it was a short walk to the Gondala. We ventured into the Keystone Village at night and went to the hot tub every night. My family really enjoyed their stay! Had a great week over Presidents Day weekend. The condo was perfect for my family of 4. Reports of hard beds which scared me but they were fine. My husband actually preferred it. The furniture was a little worn some worse then others but the owners wotte in their book that they were getting new furniture. It’s s great location right on the main run into the gondola and lift. Issue with balcony door but someone was there within a couple of hours to resolve the issue. Open floor plan and rooms separated to allow for privacy. Very nice unit. One of the best we stayed at over the years. Very nice and very easy to arrange. Wonderful view and extremely clean. Wonderful condo! Great location- beautiful views of slopes, peaceful and quiet, but only short walk to River Run Village! The condo living area and kitchen was spacious for family gathering. Very nice condo. We have stayed at many Lone Eagle properties before. Furniture is a little tired and outdated. Great view of the ski mountain. Spacious, comfortable, quiet and great location! Our first stay at Lone Eagle after having stayed in nearly every other complex in Keystone over the last ten years. 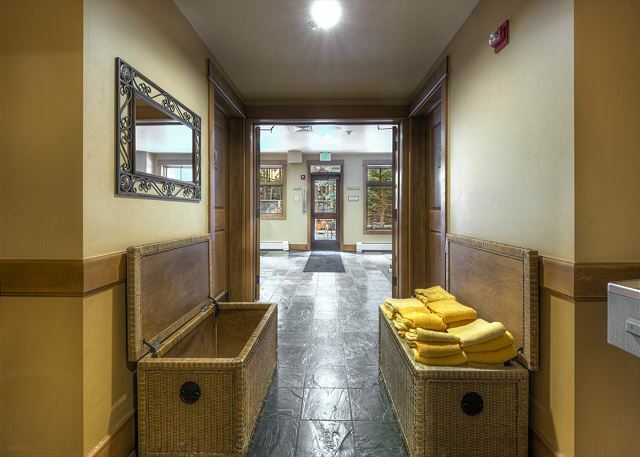 The building has a great location, period, and the unit has a front row seat to the mountain. We especially loved the shaded pool and hot tub on hot summer days. The unit is very spacious and well equipped. The pictures and description are accurate. Previous reviews noted hard beds but they were fine. We did find a lot of minor repairs that need to be resolved, mainly electrical....lights, fans, switches, etc....but, don't let that discourage your impression, they can be easily resolved by the owner. We loved the large deck and watching the bike riders come down the hill and watching deer stroll across the ski run in the early evening. Access is great, elevator drops you off directly across from the entrance. We found the unit to be very quiet despite a busy holiday weekend. Overall, definitely 5/5 stars for any time of year and a wonderful solitude to slip away away for a few days. SCMR was very easy to book through and helpful with our questions. Everything went smoothly as it should. We rented 3 condo units in total celebrating our 50th Anniversary with our whole family. Accommodations were everything we expected and then some! Unfortunately my husband had a stroke on our 2nd full day and we experienced the excellent care of St. Anthony's Hospital in Frisco and Lakewood. We ended up all leaving a day early to head back to Texas. The family enjoyed the time we got to share in beautiful Keystone, Colorado. We had a great trip to KeyStone for Easter weekend. This condo was perfect for our family of five, and the location couldn't be better. Everything was convenient and the view was magnificent. We'll definitely be back. We've stayed in Lone Eagle condos for the last 7 years. All the condos are very nice in this ski in/out location. This unit LE3024 is slope side with great views from the walk out balcony. Sleeps 8 easily with somewhat hard mattress' and 2 bathrooms. I recommend and stay again in this condo. This is the third time we have stayed in 3024. We love this unit. Roomy and the location is perfect. My group very much enjoyed their stay at Lone Eagle. Summit County Mountain Retreats were great to work with, very responsive when I had questions. We had a great time. Perfect location. Furniture slightly dated. Only down side was the mattresses were firmer than we like. This house was so much more than we expected. Incredibly large, well decorated, and all the amenities one could want. Great value! 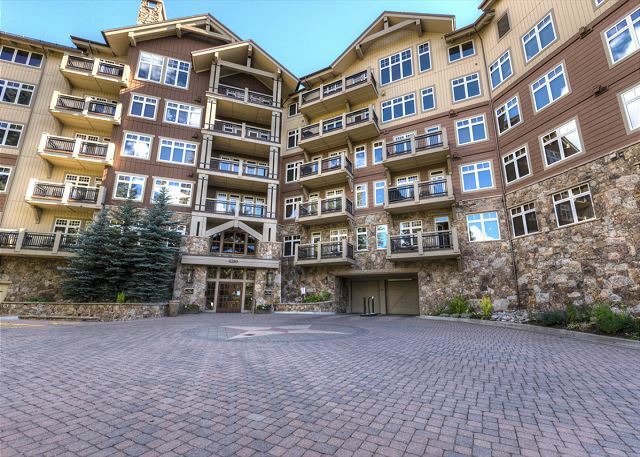 This condo is the perfect location for skiers and people that just want to enjoy the view! It is located closely to River Run Village. There is a nice heated walking trail that connects to the bridge to get to the village. If skiing, it is perfect! The ski locker room was also a great addition to our ski trip! It made everything very convenient. The heated pool and hot tub was a blast for our kids. We plan on booking Lone Eagle for our trips from now on! We loved the rental and though the location was great. The unit was very comfortable and the views were absolutely beautiful. The furniture was okay but a little tired looking. The fireworks display on Saturday night was so pretty and we had the perfect view from our balcony. We loved the heated garage and that the complex was small so that everything was easy to get to. The only thing I would complain about is that the mattresses were very hard and none of us slept well due to the hard mattresses. I read other reviews stating the same problem so I would hope the owners would try and fix the problem because I would really like to rent this unit again but would hesitate because of the mattresses. Nice condo. Clean. Great view of the ski slope. Terrible pillows in the master bedroom. We enjoyed our stay and loved the location. The property was clean and quiet with great amenities. Our only recommendation is to include some paper towels, ziplock bags or aluminum foil, and sharper knives. We would recommend this location to friends and return if we are in the area again. We loved our stay except for our bed. It was very uncomfortable and we did not sleep well. Would not select this condo without changes in beds. We had a wonderful time, as always this rental team did a great job! There were a bunch of small issues in the condo, the hot water was almost impossible to regulate in the showers in both bathrooms, the under cabinet lighting in the kitchen was missing bulbs and the bulbs that did work weren't working properly so they kept going off and on, we couldn't close the window in the Master Bedroom and finally there were not any large frying pans or large pots so cooking for multiple people was very difficult. In a condo that sleeps 8, the kitchen needs to be adequately outfitted for cooking for 8 people. Great location! For Summer Too! Great condo, great location - able to sit on the deck and watch the kids hit the bike park. Only suggestion - new pillows! The spot was great. Location was pretty good. 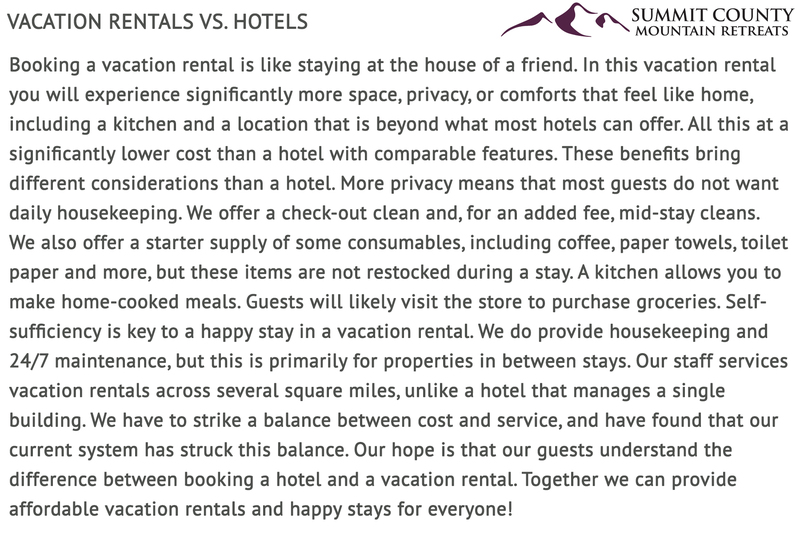 We have rented from Summit County Mountain Retreats many times in the past and have always had great service. The past few times we have made our reservations with Matt and he takes great care of us making sure everything goes just perfect. Plus the cute girls in the office are super nice too!! As far as this property goes it is very nice and everything is in great shape. We will stay here again without a doubt as soon as we can get back to keystone. Thanks SCMR!! Thank you for staying with us. We are sorry there was a mix up with the early checkin and we will notify our housekeeping manager that the coffee pot was not cleaned. This property was exactly as described, and we would recommend it highly. Our stay was "off season", but we had lots of snow! 🙂 The fire pit on the lower level didn't work (only disappointment). We rented this condo in the off-season, so the facility and the townsite was very quiet, which was fine for us. We skied at Arapahoe and were able to run to Dillon for any shopping needs, 5 minutes in either direction. 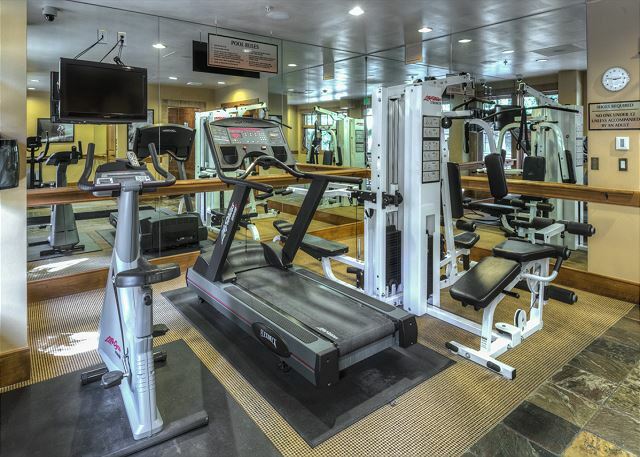 The facility was well maintained and in a great location. Despite being off-season, we had full access to all amenities and the heat was still on in the pool and hot tub. We really enjoyed our stay. It was a great location with awesome views. Ther was plenty of room for all of us. We absolutely loved this unit. Great view of the mountain. Perfect for our family of four. The unit was well represented and very comfortable. The balcony view of the slope and ease of access to the slopes was great! Very clean accommodations. Plenty of space for our family of 6. Hope to be able to stay longer next time. This vacation property was perfect! Had everything we needed and plenty of room for everything we needed! I get a room somewhere in keystone every birthday.... And so far this has been my best stay yet! Best part is.... 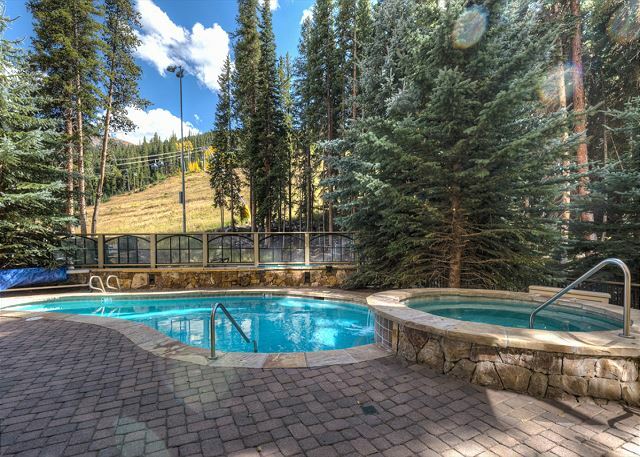 Going through VRBO and summit county mountain retreats saved me tons of money and i was able to find a condo in the most perfect spot possible! Thanks again for another incredible birthday adventure with you guys.... And until next time! Thank you for the high praise. We love it when folks who used to pay sky high prices from the resort find out that they can save a bundle with us. It is a true win win. We run our operation as lean as possible without sacrificing important service. This allows owners to make as much from us as they did from the other guys and for our guests to see huge savings! We look forward to having you again! Nice get away. Very comfortable condo and Builiding. We went just to get away in the fall, nothing in River Run as far as shopping, food and bars are open during most of October. Would have been good to know, may have stayed closer to dillon. Stayed for the long Labor Day weekend and enjoyed our stay immensely. Condo is well maintained. Views are great and proximity to River Run is perfect. We are sorry there was a confusion with the Realtor instructions. This mistake has been corrected! Enjoyed our stay this summer. The condo was very roomy for our family of four. The master bath included robes which was a nice surprise. Our view was of the gondola and a small bike park. Would be fun in the winter, but would have preferred the trees in the summer. 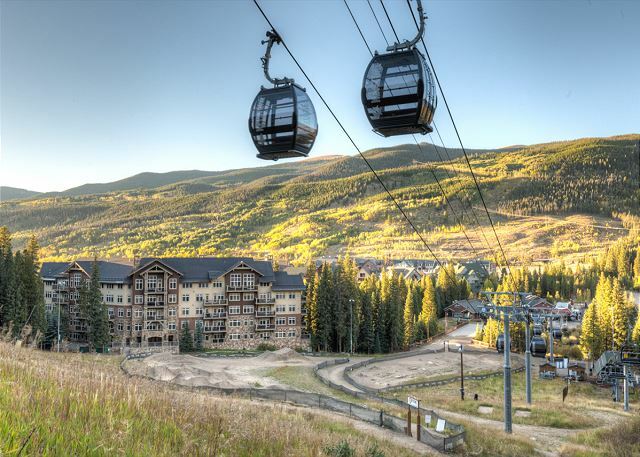 Free Gondola ride on Friday afternoon and walking distance to Keystone Village a plus. Inxpot coffeehouse is a great place to chill. Relaxing, comfortable, everything we needed at our fingertips. Having stayed at Lone Eagle last month, we weren't aware that this particular property was actually managed by another company. Not having a manager on duty 24/7 made our first day a bit unsettling as we were having key issues. But once that got all settled-we were loving life. Check in was a breeze, courteous staff, condo is the best location...we hope to be back this season!! Happy New Year! This is not our first time renting a condo at Lone Eagle. 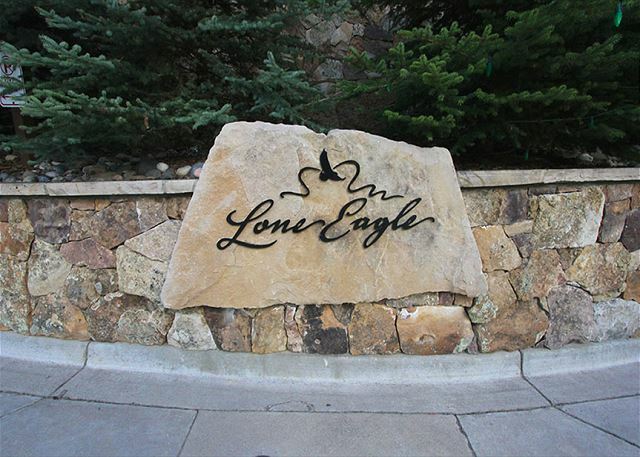 That being said, we will always choose Lone eagle as our only condo to stay in at Keystone. It is no doubt the best location for the best view! Ski in and out is perfect for a short stay. We spent most of our time on the mountain and were grateful that the condo was conveniently close. Condo #3024 was very spacious. Equipped with stainless steel appliances and large kitchen area made the trip worthwhile. Overall, we loved our stay at Lone Eagle #3024. Great location. Stocked well. Beds not as comfortable as we would expect for a place like this. For example, the Sheets were rough, and mattresses hard. Master bath shower did not drain well. Beautiful view. Taking the trash out was a pain. Common areas were great, well stocked and clean. Great unit in a great location. Top notch experience all around. Lovely place to stay. We had 7 adults in our group and were comfortable with the sleeping arrangements. Conveniently located. Beautiful views. Loved the size of the condo. We had 6 people and there was more than enough space. Loved the location - the view off the balcony was amazing. The property management company was great to work with. A few recommendations: for this caliber of condo price, the beds and porch chairs should be updated...they are incredibly uncomfortable. Also, lack of wifi is archaic...we were only there for 3 nights so it wasn't a big deal. But when we come out for 2 weeks, I would have rented somewhere else because wifi is everywhere now. The condo was in a great location and very is beautiful. Needs a little more than surface cleaning from the cleaning crew. Great location, amenities, moose (yes, we saw moose on property! ), and perfect for kids!! The location was incredible! We came to watch the Big Mountain Enduro race and were pleasantly surprised to be able to see 4 of the 6 stage finishes from our patio. The property is very nice but needs some minor repairs and better amenities (silverware, dishes, pots and pans) in the kitchen. The kitchen utensils were a mismatch of poor quality stuff. We had three people and had more than enough room for friends to come and enjoy the place for an evening of relaxation and conversation. The underground parking with an elevator to our floor was an added bonus and the security of the building was great. The weather all weekend was perfect and we really enjoyed our stay.We found broken glass on the floor in the kitchen and a wad of hair in the master bathroom shower. The rest of the unit was very clean and comfortable.Not sure if we will be in Keystone again anytime soon but we would definitely stay here again if the opportunity presented itself. We love the setting of Lone Eagle. The building and the amenities are great, we also loved the robes. The only problem was there was a lot of loud talking by the fire pit late into the night. Beautiful condo with great furnishings.The beds were uncomfortable and the pillows were cheap. This caused us to not sleep well and it got hot at night. Would like to stay here again if this was improved. Condo overlooks river run. Step off veranda an onto the slopes and ski down to the summit express. Building maintained very well. Lone Eagle, a gem in Keystone. SCMR a thumbs up. Review by Mary Kay H.
Everything about this place is awesome. Great location for the ski in ski out skier. only place to stay in Keystone! A true ski in/ ski out accommodation. GREAT Condo! Mgmt made the experience painless. Lone Eagle is right on the slope it provided a great home base for my family's Thanksgiving vacation. The only thing I think I would fix would be how someone mounted the 55" TV. It is done sloppy with unprofessional wiring... Looks like a 10 year old mounted it. Would be nice to have HD receivers if you are going to have a large HD screen. WOW. Kate in your office was just exceptional with all of our questions. We extended our stay easily, got new parking permits, and found out what was going on when the electricity went out! Vera (I think that's her name) from maintenance even called me back to let me know that the Tap House had electricity so we could go watch the Broncos game!! Great service! Thank you so much for everything! Once again, we had a wonderful time staying in 3024. This unit, and Lone Eagle. has every amenity to make a visit comfortable and relaxing. And Summit County Mt. Retreats always does a great job assisting with reservations. We had a wonderful stay-- lovely condo! 🙂 The location was very convenient and the amenities were top notch. We would recommend this condo anytime! Our experience was very pleasant. We really liked the location of the condo and all of the amenities. We definitely want to come back during the winter for snow skiing! We had a great time and the condo was awesome. The views were great - right out the window was the slope and chair lift. Everything was as described in the rental agreement. Would absolutely rent again!! Location, location, location! Doesn't get any better! Relaxing, comfortable, great location! We will be back. We had an amazing time, and I would highly recommend this condo and overall condo complex of Lone Eagle. Our condo had great proximity to the pool/jacuzzi, ski lockers, etc. It was very well appointed. AWESOME! Two issues... 1) the disadvantage of the ski-in/ski-out right by the ski run was that the snow plows work very late at night. They were very loud and kept us up. I would know to bring ear plugs and ipods for the night. 2) There was not enough living area seating room - only enough for 4 people. We were a party of 6. That was a little bit of a bummer, but we managed. Thank you! My family recently stayed for spring break and had a wonderful time. The accomadations were perfect! Very nice condo with excellent location and amenities. Nice kitchen and living area. The linens (pillows, sheets) were ok but could be updated. After doing the "Aspen Thing" for 7 or 8 years, we decided it was time to go somewhere more family oriented (we take our grandkids now). We are spoiled to the ski in/ski out & Lone Eagle provides that nicely (love the location by gondola). Lone Eagle is a nice place & has a good ambiance & would love to come back. The grandkids loved the hot cocoa in the lobby & have voted Keystone as new ski destination for next trips (over Aspen). 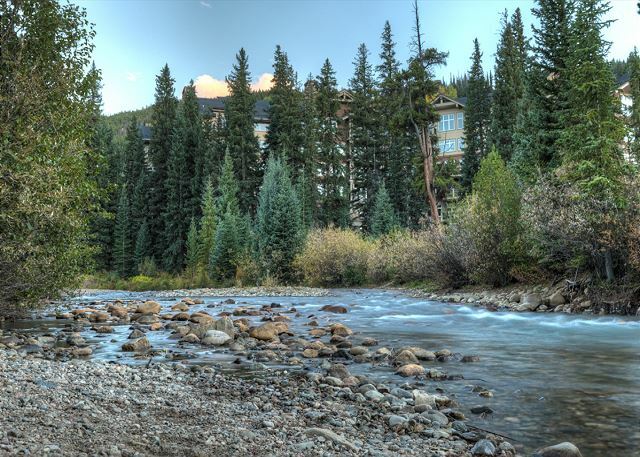 This is the best location in Keystone and the nicest place I have stayed in. Beautiful room and great slope view. Nice common area with free coffee. Brightly lit and clean heated parking. Heated drive into Lone Eagle (snow melted right off). The property manager was very nice and helpful during our early December 2012 visit. We could NOT have had a better stay in Keystone! Lone Eagle is a lovely place and 3024 owners are so thoughtful & generous! The 3 NEW flat screen tvs were a treat and the 2 humidifiers saved our poor noses from the dry Colo air. It is gorgeous and you could not have a better view of River Run's slope day/night. LOVED every bit and did NOT want to leave! Looking forward to spring, summer & next yr already! Outstanding location and beautiful accomodations. Could not have had a nicer stay or place to stay. Thank you! The location is awesome, loved pretttymuch everything about the experience. I found the bed and pillow uncomfortable, but would stay again and bring my own pillows. The garbage disposal area is a bit inconvinient, but otherwise the place and service ROCKED. I would be interested in info for that building and similar units for ski season if you have it. the Living Social deal was fantastic, send me other deals if you have them. I forgot to turn on the dishwasher, i loaded it and left...sorry :(. I blame the kids!! 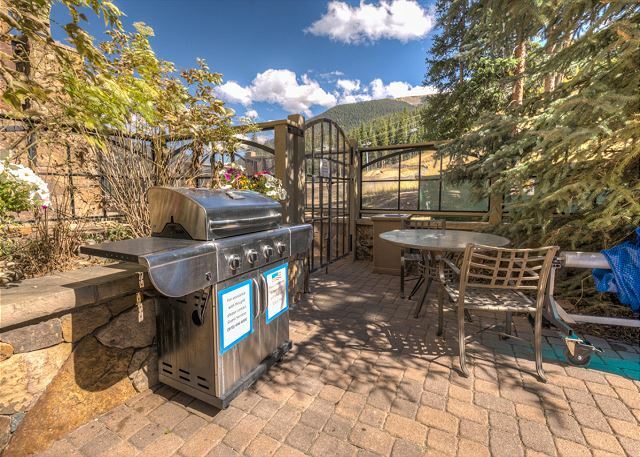 We had such a wonderful time at this gorgeous Condo at Lone Eagle in Keystone, CO. It was right on the slopes. The pictures don't do this place justice. It's really nice with great amenities. Our stay was perfect. Everything was great, especially the location. My only complaint is the quality of the tv. For a condo that nice they need widescreen HD. What a great place. So close to the gondola, which our snowboarding grandson loved. I really liked watching the skiers come down from teh balcony. Surprisingly quiet for being so close to all the action. The hot tub was a special treat, especially when the full moon came over the mountains! Thank you! We've been coming back to Lone Eagle property for 4 years in a row now.... Absolutely perfect!!!! Best place in Keystone by far!!! !